Oh, hey there. Have you missed me? I’ve certainly missed this blog. And cooking. In the past three weeks, I lunched with friends in Raleigh and said my goodbyes, I packed my life into boxes and suitcases, I flew to New York City, I started a job, and I moved into an apartment in Brooklyn. Somehow, the move was easier than it sounded. I survived, at least. And now I have a NYC kitchen. You might be surprised to learn that I managed to fit all of my kitchen supplies into it, with room to spare. The first thing I made was this sauce, just like mom makes. Sweet and savory and hearty and just right for these first cold days of fall. 1) Preheat oven to 400 degrees. Spread chopped red peppers evenly on a cookie sheet, drizzle with 1 tablespoon of olive oil, and put in oven. Bake for about 40 minutes, or until soft and slightly blackened around the edges. 2) 10 minutes before the red peppers are done, place a pot on medium heat. Add 2 tablespoons of olive oil. Add eggplant and onion. Cook until soft. 3) Meanwhile, cook sausage until browned. Add sausage, roasted red peppers and minced garlic to pot. 4) Stir in tomato sauce, cayenne pepper, oregano, basil, salt and pepper. Cover and cook until bubbling. 5) Serve with pasta and sprinkle with feta cheese. 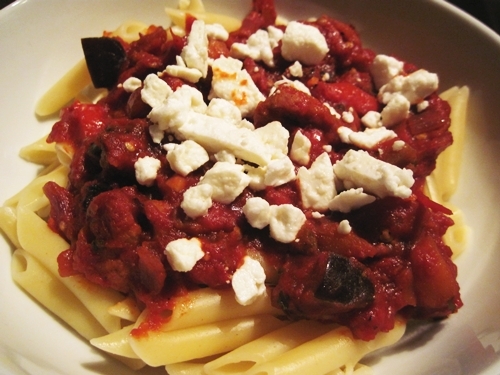 This entry was posted in Italian, pasta, sauce and tagged eggplant, garlic, red peppers, sausage, tomatoes. Bookmark the permalink. Thanks! I am loving every minute.